If you are in business or are responsible for the management of commercial premises, then glazed areas must meet British Standard BS6206 to help you comply with government guidelines in relation to glass safety. The diagram above is part of the building regulations, Document ‘N’ that provides details on protection against impact, opening and cleaning in glazed areas. The green shaded areas show the critical locations for section ‘N1’ of document ‘N’ which vary according to where the glass is positioned. 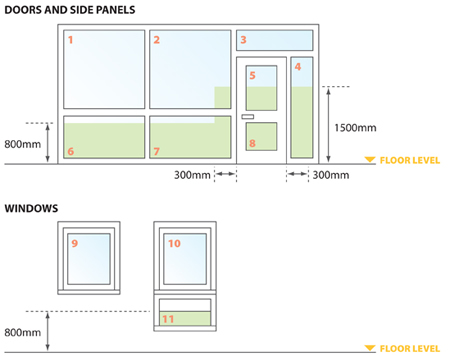 Numbered panels 2, 4, 5, 6, 7, 8 and 11 are specific to this requirement. As part of this standard, there are specific guidelines for glazed panels and areas that must offer the correct level of protection for public visitors, customers and your own employees. Our Common Questions section addresses this and other relevant points in more detail. Tinting Express has assisted numerous businesses by fitting the correct type of window film that immediately brings existing, non-compliant glass up to the correct standard. The benefits will be appreciated in terms of regulatory compliance, safety, security, aesthetics and also give you peace of mind. The process of installation is straightforward and our site survey will help flag up any potential issues in advance – meaning our work should not cause your business undue disruption. Please get in touch if you would like to discuss this further. Improve staff productivity by creating more comfortable environments, reducing eye strain etc.